I am an absolutely huge believer in the power of a real financial plan. I also believe that I create financial plans that are among the best in the business. They have to be good, because my business depends on the plan. After my clients thoroughly review their plan, it is then up to them to decide if they want to do business with me and hire me as their financial planner by following through with some, or all of my recommendations. I need all of the information in order to complete a financial plan, otherwise it won’t be accurate and my advice might be bad if I make incorrect assumptions. It usually takes me somewhere between 5 and 10 hours to write my plans and there is no guarantee I will ever be compensated for that work, so I need to know the potential client is initially engaged in the process. As it sits right now, I have written 6 plans that haven’t resulted in the potential client working with me. I think 2 of those are still going to come on board. I’m obviously never very excited when I do all that work for no reason, but it’s a risk I have to take and I always learn something when I write a new plan, which will help me become better at my job. When we go through the process of becoming a CERTIFIED FINANCIAL PLANNER Professional, we have to write a financial plan from scratch based on a fake couple. Most people hated this, but when I was in Construction Estimating, I used to have to write reports very similar to a financial plan for the bank to get them to release funds to the builder. I knew it could become efficient if there were areas that could just have small details changed based on the client. So, now that I have written dozens of financial plans, I have a bit of a template for different types of clients and it becomes more efficient. I also thought when we were doing the fake plan that if I could get pretty much any Canadian to provide me with their financial information and I had the ability to sell them products that were better and had lower fees, then I could improve anyone’s financial situation. I’d love to find someone who I couldn’t help. One guy was close, but he was the most informed client I have ever met, who has done such a good job planning for himself that I will tell stories about him for years. He was also more knowledgable than a lot of actual advisors I know. So, when I was told to quit comedy or not be able to be a Consultant at Investors Group anymore, I decided I would try to use my comedy and knowledge to generate leads and then I would write plans that discuss every aspect of a person’s financial life. It turned out to be a very good decision as I have never been happier with my professional life. So what does a K4 Plan look like? Every bank and institution has financial planning software that they use to give an estimate of what someone’s retirement will look like and this software is very important to get the math correct and to run different scenarios, but that is not a financial plan. That is a snapshot of what you’re tracking towards. It literally takes 5 to 10 minutes to input information into that software if you know what you’re doing. I personally use a software company called RazorPlan, based out of St. Albert, because I like the look of their software generated plans and I like that I’m supporting a local company. So, when I get a prospective client’s information, I will input their information into the software and see how they are tracking towards their goals. Some people are ahead of their goals, while others are way behind. My next step is to do some research and crunch some numbers for myself and then I will test out some different scenarios to improve their situation. The best ones are when I can significantly increase retirement income numbers without them having to save any more money than they already are. So, this is what a few of the important pages look like in a sample RazorPlan. That’s step 1 and then I get to writing the financial plan. The first thing I do is talk about the assumptions I have to make when developing a financial plan, because there are some things we can only assume. Your estimated rate of return (I use the FPSC guidelines. Historically these numbers are low, but that will hopefully be a good thing as it will be a good thing for everyone if we outperform those numbers). Below is a video where I explain the rates of return we are supposed to project for our clients. Just because your guy showed you that his clients got 9.0% over the last 10 years doesn’t mean that’s what we should tell you to expect going forward. Next I will show two graphs and explain the difference in the graphs. The first one shows how someone is tracking towards retirement without changing a single thing and the next is the improvement they can expect if they follow through with every recommendation in the plan. Most people don’t follow through 100%, so I will only provide the Base software plan for their review and when we do the annual review I will start tracking the changes they have made then. Now comes the real plan, where I break down the 6-areas of Financial Planning and put them in order of importance based on the clients circumstances. So, let’s now go through and look at what each area can consist of. Some of them can and will overlap. Detailed look at existing investment accounts. Fees, risk, diversification. I do not care about past performance and I do not talk about comparing past returns at any point. You can Google your funds if you want and they will almost always be underperforming the index they are supposed to be tracking. I want you to start investing in that index. New accounts that could be opened. RRSP, Spousal RRSP, TFSA, RESP, Non-registered, High-Interest Savings, etc. 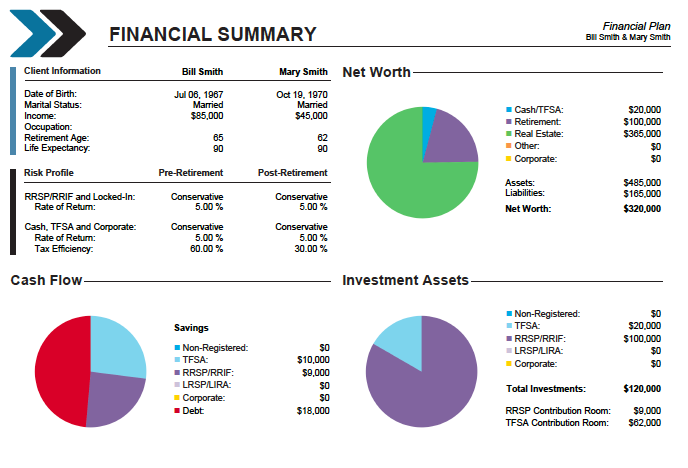 A look and discussion about work accounts, pensions, share-ownership plans, etc. A discussion about rental properties, business assets, etc. I will then talk about the accounts I believe should be moved based solely on the investment fees and if there is a self-directed account with low fees, I will just give some tips about how to better structure the account if I see some problem areas. With the work accounts, I will explain the investments to help clients understand what the bulk of their money is invested in. I then sum up the savings and break down every dollar K4 Financial would be paid if you were to transfer these accounts and work with me. Everyone hates taxes and decreasing your taxes is one area where we can actually save a lot of real money. For employees, there aren’t too many exciting ways to save a lot of tax dollars until retirement, with the exception of RRSP planning, but for retirees, or self-employed people, this is always a big part of the plan. How to write-off my advisor fees (not available with RRSP and TFSA accounts). Creating a tax-efficient retirement income that maximizes cash flow and minimizes tax rates. Setting up corporations, or drawing income from the corp.
How much tax will you owe? Recommendations for what insurance you should buy or potentially replace. Unless there is a very clear cut reason for a specific product, I don’t actually talk about products at this point. I just suggest recommended amounts and types of insurance. Life Insurance, Critical Illness, Disability, Health and Dental, Travel Insurance. After the fact, when we are working together, if the client wants insurance, I will do up another sheet explaining their options based on the amounts they want. I will then disclose how much K4 would be compensated for selling that product. I want my clients to know I am not pushing one product over the other in order to get a big commission. That’s pretty much it. Sometimes it can be very complex and sometimes it can be quite simple. Just know that whether you have $1,000,000 or $10,000, I am going to put the same thought and effort into creating a plan for you. Maybe that’s a mistake on my part, but I am not in this for a quick and easy dollar, so I am always hopeful that one day those $10,000 clients will one day also be my million dollar clients through proper long-term planning. I don’t want K4 to be known as a company that excludes people, because they aren’t wealthy enough to talk to us. Money is hard and your money is important to you, whether you have a little bit, or a lot. If you want a financial plan, then all you have to do is ask and I hope to impress you so much that you’ll be extremely comfortable in going forward with some of my recommendations and choosing to work with me as your financial planner.